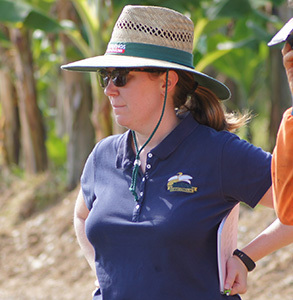 Dale shares her insights and experiences working with banana farmers in the Reef catchment. Dale: My name is Dale Bennett. Dale: I work for the Australian Banana Growers Council based at the South Johnstone Research Station which is near Innisfail in north Queensland. My role is funded by the Australian Government's Reef Trust 3 program and our focus is extension, innovation and grants. So based in South Johnstone as part of the Wet Tropics. So there's obviously lots of high rainfall. It's also where the majority of the bananas are grown in Australia. So I think something like 95 percent of the Australian bananas are grown in this area hence why our roles are based here. Because most growers are here so it's very green it's very pretty and lots of agriculture and tourism and other uses, that sort of thing. Vanessa: What is it about the landscape here or the climate that's good for bananas? Dale: Exactly right. That's the amount of rain that we get. Sometimes that is a bit too much rain. As with anything. But it's also being that it's a tropical crop.It’s a perfect banana growing area. So the right temperature and climate and the right amount of rain, good soils in some of the parts of the catchments for growing bananas. Vanessa: What are the main challenges that banana farmers face in their day to day lives and trying to run a banana farm? Dale: They've got quite a few challenges at the moment. They're finally experiencing some good prices for bananas but for the last three or so years they've been getting very low returns. So getting money in has been a bit of an issue for growers. There's also grappling with Panama Tropical Race 4 and the biosecurity implications that come along with that. So there's been a lot of investment that growers have had to put in for infrastructure on their farms to protect themselves and try and hold off TR4 for as long as we can. So those are some of the main challenges and then of course running a business comes with its own challenges with managing staff. Growing bananas is a very intensive, labour intensive industry. So there's lots of people to manage and lots of things that need to be done. A lot of growers work six days a week in their business and they're very busy. Vanessa: That's a good lead in to what we're here to talk about today which is water quality and it's just another thing to kind of add to the list of stuff that they need to think about. What are the main challenges for banana farming when it comes to water quality? Dale: Probably the things that they grapple with is the cost of implementing some of the mitigation strategies that they could use. Things like putting in a fertigation system. A lot of them would love to do that but they're incredibly expensive. Other practices like slashing their inter rows that's a time sort of pressure on them it's another job they've got to get done so they want to do it but it's finding the time and the money and the manpower to do it. I guess just one of the challenges. Vanessa: Can you expand on what fertigation means? Dale: So a lot of growers have moved to this already so it's essentially putting out liquid nutrients through their irrigation system. So it means that they can target how much they put out, how often some of them are doing it every time they irrigate so a tiny amount each time or they do it weekly or fortnightly so it means that there's less there to be lost to the environment as well. And obviously if they are irrigating it's a bit more of a streamlined process that already putting irrigation out and fertilising at the same time it takes one job away from them. Vanessa: So you meet a lot of banana growers and your sense is that they do want to make sure that the water coming off their farm is of good quality? Dale: Definitely. And it's not necessarily just because of an environmental reason, it makes sense economically for them. They know that keeping pesticides and nutrients and sediment on their farm is good for their business. It doesn't make sense for it to move off their farm. So it's not that they're not trying and they don't understand the importance of it. It's just that there's some things that get in their way like how much it costs or how long it takes to do these things. Vanessa: Yeah. So do you think as a group banana growers are connected to bigger catchment issues do they think about the downstream what's happening in the river and eventually the ocean. Is that something that is too much to ask them to be contemplating when they are managing the land? Dale: Yes and no. I think there's some growers that would feel very much connected to the wider environment a lot of them are recreational fishers and love going out to the Reef. So it's very important to them. There's also, you get a sense of stewardship for the land as well. They've probably been farming for generations so they think well they're going to hand this onto their kids one day. And it's important that they protect not just their farm but the local environment. So I mean there would be some people that it might be a bit too much for them to worry about because they've got so much else on their plate but there's definitely a lot of people that do care about that sort of thing. Vanessa: Can you talk about your work with banana growers. How exactly through your job are you trying to influence this whole issue? Dale: OK so we work directly with growers so as I said our focus is extension, innovation and grants. Vanessa: Most people just eat bananas without giving it a second thought. They are cheap, you know reasonably for what you get. And I think I've seen the dependence on bananas because I know when there's been a shortage, the kind of outcry especially from city folk yes. Do your insights make you see agricultural products differently? Dale: Oh definitely definitely. I've only been in the role for two years and I didn't know anything about bananas before I started really. So it is it has given me an appreciation and I don't think that everyone is as connected to where our food comes from as we should be. And I guess too we don't always appreciate how much effort goes in to growing our food. We just go down the supermarket and buy it and it's easy for us. But I know growers, a lot of them put their heart and soul into what they do. They really care about what they do and we don't necessarily appreciate that. Vanessa: The reason I asked you about that is because I think when we're constantly asking farmers to do this that and the other to help the environment they can sometimes feel it's unfair that they bear that burden when we all get the benefits of what they do. And so I did sort of want to lean now into some questions about what are we asking them to do for water quality in light of the fact that it is a lot to ask but I mean what are the kind of key things that we're asking banana growers to do differently? Dale: The research indicates that per hectare on a hectare back basis that unfortunately the banana industry has very high sediment runoff. Sediment conservation is the industry's biggest challenge. So our number one is to encourage growers to have at least 60 percent living or dead covered ground. And that is supposed to lead to a big reduction in sediment run-off. In saying that I've been on quite a few farms and I've been impressed by the level of ground cover that is there. Vanessa: What do they use as ground cover? What constitutes ground cover? Dale: So we recommend living ground cover so grasses weeds whatever will grow essentially and being up here pretty much anything will grow in the Wet Tropics. It’s really a challengeto keep it maintained and keep it at a level that you can actually get in there and pick your bunches and things like that. Yes. So mainly living or dead. So the other thing is any banana trash so bananas put out a lot of leaves and dead heads and things like that so growers tend to put them in the beds to cover the ground there as well. Vanessa: And just for someone who has no concept of sediment or soil loss. The coverage is literally helping to keep the soil on the farm? Dale: Yeah exactly right. So ground cover or covered ground plays a few roles. So for rainfall impact it reduces that pressure on the soils so soil particles aren't dislodged then it's sort of a buffer between the rain and the soil. And then if sediment does move it's a source of something that actually captures the sediment before it can leave. So it performs a few functions. Vanessa: Right. What is the thing that drives you, you know motivates you and gives you job satisfaction doing this kind of work? Dale: I have to sayworking with the growers. Yeah I feel incredibly lucky. All of the ones that I've met have been lovely. So yeah. And the passion for what they do too really keeps me going. It's definitely different to what I anticipated but it's a lot better than what I thought it would be. Vanessa: You know I've read a lot of research that talks about that really the only way to connect facts, to get facts out to people is through personal relationship and individual engagement and I guess I can see that that's kind of what you do. You’re like that middle person between lots of information and agendas and politics and science and the people on the ground doing the work. So I mean that must be a challenging position to be in. Dale: Yeah definitely. So my background I do have a degree Bachelor of Science degree and I'm currently working on my Master's in Natural Resource Management. So I do understand the science which is great but with my couple of years experience with working with bananas I like to think that I understand a little bit of how banana farms work and what challenges growers face. So I mean that's what extension is we are the interface between science and growers. It can be a tricky situation. But yeah I mean that's that's our role and that's why I think that's why this extension is so important. I think it's something that used to be seen as important and then it sort of went out of flavour. There used to be colleges you could go to learn how to do extension. And thankfully it's now coming back into force I guess. Vanessa: Can you talk more about the resistance to science so where do you think the scepticism lies or the challenges in. I think this goes way beyond farmers to general society when they're faced with difficult issues. Where do you think the scepticism begins when they're faced with scientific realities? Dale: I think the challenge is how does it relate to them personally. I was part of the Major Integrated Project ideas forums and that came up time and again from growers. They said ‘show me it's my N, show me it's my nitrogen and I will do something about it’, so it can be difficult for them to see themselves I suppose in the data if it's aggregated or over a large area and see well how does my day to day management, how does that influence what's coming down to the Reef? There's sort of that disconnect. I don't know if it's that I don't believe it. It's just I don't see how they fit into that big picture. Vanessa: So what can you do to help with that? Dale: Well that's what our role is I suppose. The good thing I think is that we can take it back to them with and make it relevant to their farm. So a lot of what we suggest is actually going to help them economically as well. So not just the environment but there are benefits to things like putting in a fertigation system that's going to help them with their production or help them with their time balance or whatever. Yeah I guess that's our role. Vanessa: I guess we heard a lot from cane growers that they really want things like real data from their farm or from their river and that once we do broader modelling even though it's based on huge amounts of real data they start to feel uncomfortable with that. Do you hear similar sorts of things from banana growers? Dale: Like I said I heard that a lot at the Major Integrated Projects Ideas Forum but they were mainly cane growers there because like I said getting banana growers along to things a bit of a challenge. But I suspect they probably feel the same. Like I said before it's hard for them to see themselves in that aggregated data. And I believe that if they were if you could demonstrate to them that something they were doing was resulting in run-off that they would want to change it. And like I said not just because of the environmental benefits but because economically it doesn't make sense if they're losing sediment that's you know a lot of the time that's their topsoil that's their healthiest soil that's their bread and butter like that's what they grow their crop in. And if you're losing nutrients and pesticides that's money down the drain so they don't want to see that happening but they need to know if it's them that's doing it and how to fix it if it is. Vanessa: And it might be repeating a little bit what you said before but is that again something you can help them get the answers to? Dale: Yes absolutely. That's our role. So as extension officers we do have solutions that we can give them or we can put them in contact with experts that can help them. So we have our local soil conservation expert that we can get them in contact with and he can help them develop a sediment management plan. So that's our job we are the conduit or we are the sources of information for how to fix that sort of stuff. Vanessa: Can you talk about projects that are really at the cutting edge of solving water quality issues? Dale: Well I'm probably tooting my own horn here. Vanessa: Go ahead. This is your big chance. Dale: We're actually running our own innovation trial with a grower and we're very incredibly grateful because it's an on-farm trial so it means it's commercially relevant. So the innovation is changing a bagging machine which is a machine that is used every week. It drives up and down the banana rows. It's sort of an elevated work platform so they use it to put bags over the bunches and to string the bunches and things like that. So they usually have very narrow tyres on them that can chop up the inter row and cause sediment runoff. And we're looking at actually changing those tyres to four individual tracks to reduce ground pressure and protect ground cover. So we're in the process of installing some monitoring equipment on the grower’s farm he's already got the tracks on his machine. So far he's loving them but we haven't had a wet season yet. So we'll see how they go but yeah. So that's really cool to be part of that. It's actually part of my degree that I'm doing. So it's going to form my Master's project. So it's just dovetailed really nicely and with my role that I can do this on-farm relevant project that hopefully is going to help the industry. So if this proof of concept works then it could be something that's adopted across the industry potentially. Vanessa: If it works well what would be the means that a banana grower or even you guys would use to spread the word. And how does the word get out when people say this is a good idea, let's all try this? Dale: Sure. Okay so we've got lots of avenues for that so we have our communications team which put out an e-bulletin which if not all but most of the growers should be part of that. We have our website, ABGC website. We also have our Facebook page. We have a magazine that comes out every quarter as well. And next year we've also got the 2019 Banana Congress which is going to be held in the Gold Coast this year. So that's every two years. So innovations and things like that are displayed at that. DAF, Department of Agriculture and Fisheries that I work with in the same in the same building, they recently had banana roadshows. So they actually talk about the R and D (research and development) that's happening in bananas. So there's lots of opportunities for growers to learn about what's going on. I forgot there's also the Cassowary Coast Banana Growers Association so usually one of our staff goes along and talks to growers at that, they are held every two months. And my colleague and I also started a year ago the Banana Women's Network. So we meet three times a year. We've had three or four meetings now. So again that's another opportunity to network with the women hear about what their issues are, talk to them about what we're doing and they can talk to us about what they are up to. So yeah it's I guess we're sort of lucky because we're in such a small geographic area not discounting bananas that are grown elsewhere around Australia. I mean they're also incredibly important to the industry. Don't get me wrong but we are lucky because we're in, most of us are in that concentrated area that we can get the word out locally fairly easily. So the Australian Banana Growers Council is also part of the Major Integrated Project. So my colleague our manager Industry Strategy Manager and we're all involved in the extension side of things so we work with the two catchment coordinators so recently we're out on a banana growers farm who's putting in a high efficiency sediment basin which is an innovation that's that was put forward to trial. Suzette Argent has been working with one of our growers and we're invited along to watch the install for that. And then last week we also went out and learned how to service all the equipment and keep it ticking over. So yeah it's really exciting that we're part of this bigger project I guess and we're getting to work with people like Suzette and the catchment coordinators and the water quality monitoring staff and things like that so yeah it's a great project.